Jurgen Beck was the winner of the photography contest's fifth edition, titled 'Crossing Borders Shifting Boundaries: City', which was focused on diverse countries and on how the migratory movements have influenced the places and people (identities) of those territories. The primarily focus of this fifth edition was on the subject of residential spaces, public spaces, urban scattered communities and city life in general. We were interested in showin works that characterise the rich multifaceted world of contemporary cities and / or non-traditional urban communities regarding immigrants or minorities' different types of block, neighbourhoods, cultural diversity and values expressed in various types of residential and public spaces. 'Escape Architecture' is a study about modern architecture, but not a mere inventory. Beck is interested in both aesthetic and sociological meanings of a style that was born in a doubtful present to represent a shiny future. Swinging between paper and copper prints, the pictures go back and forth from a city landscapes to details, David Spero's Churches and Stefan Keppel's Entre Entree are echoing. Beck points at capitalism which was in crisis in the thirties as it is now, suggesting how evasive and tricky was that architectural reaction (What about now?). Standing like mausoleums of a desired zeitgeist, a hope rather than a reality, modernist buildings are depicted as artificial as the lives on the movie screen. 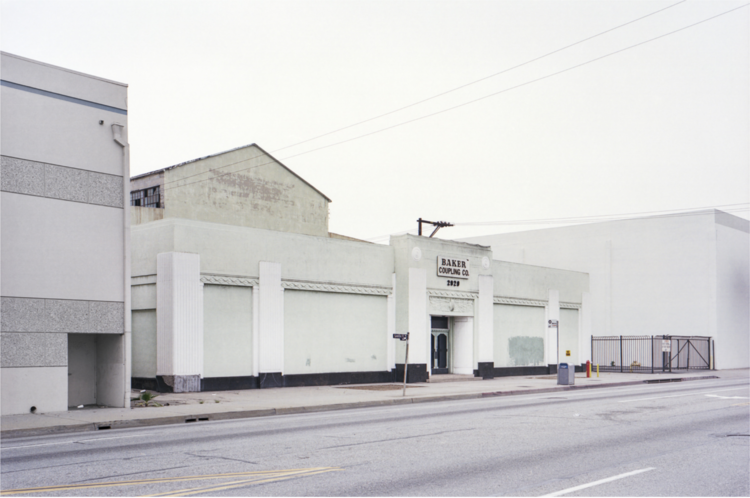 "In my recent work, I photographically retrieve and examine commercial structures of the 1920's and 1930's in their distinctive architectural manifestations: bars, movie theaters, malls, hotels, department stores and warehouses. For some time, modern architecture of the early 20th century has evolved into beign one of my art practice's distinguished subjects. The reason being that howsoever modern it may appear in terms of structure and material, these buildings are, paradoxically, highly eclectic compositions, often referencing a variety of historically incoherent, even contradictory styles. As Robert Smithson put it in his 1967 essay "Ultramodern", they function as an "architecture out of time". Embedded in an economically problematic historical context, particularly the years of the Great Depression in America, modern architecture appears to have created an elusive sphere of suggestion and illusionism as complex as the simultaneously developed realm of the moving images. Seeing the western hemisphere now, as networked late capitalist cityscapes, it is like no other interwined with the architectural remains and fragments of the coming-of-age of a modern consumer society. It is precisely a form of intoxication, an extravagant celebration of the commodity and suspension of social reality that lays at the heart of my exploration."